Timeless View of the beautiful over 50 acre lake of Saheb Bandh. 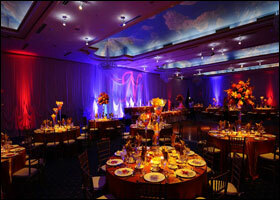 A Place for every Occasion – Weddings, Conference, Meetings, Parties. 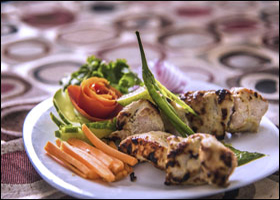 Centrally Air Conditioned Multi – Cuisine Restaurant and Coffee Shop Beautifully Landscaped Garden for your special event. 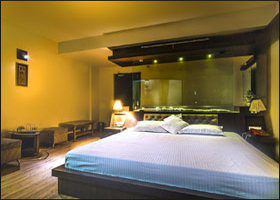 36 Centrally Air Conditioned Double Bed Room with wooden Flooring, 8 inch mattress, 32’’ LED Hospitality TV, Room Card Locking Systems, Room Refrigerators, luxurious washrooms and bath and many more modern amenities. 4000 sq. ft. Centrally Air Conditioned Banquet Hall. Ample In house parking Space. Elevators, 24 hr. Power Back, Wi-Fi Facilities in all areas. Package Tours covering all major tourist attractions of the district. Special Arrangements for Differently Able Guests. This luxury hotel is a landmark of timeless elegance. 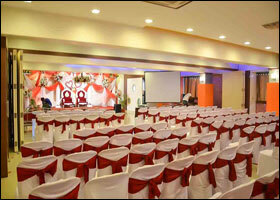 Hotel Akash Sarovar promises to make the stay of all its valued guests comfortable and enjoyable. Our rooms offer best of modern and world class standard of living combining unparalleled service and state-of-the-art technology. 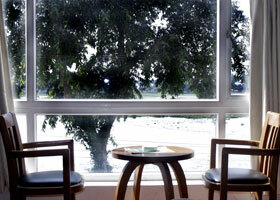 All the rooms are air conditioned and in deluxe, super-deluxe and executive suite categories. They are made with proper space utilization and soothing décor. The floors are wooden finish with simple false ceiling and LED illuminations to be more eco-friendly and aesthetic and the walls are done with textures and murals and different abstract paint­ings and handicrafts embellish the overall ambience.